People are media. The digital business in the selfie era, the book written by Aldo Agostinelli and Silvio Meazza is now available in the paperback version in English, a choice that was also dictated by its extremely immediate cut that has led it to being sought in international channels. 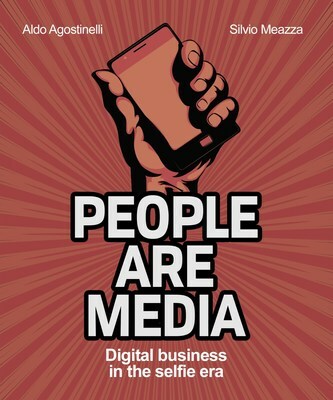 In July, in fact, as soon as the Kindle ebook was released, People are media. The digital business in the selfie era has climbed the rankings of Amazon UK, reaching the sixth position in the business category. The book demonstrates the authors ability to analyze the current scenario and return a vademecum to orientate between chat and chatbot, e-commerce, crm, blockchain, selfie and big data. This result is made even more relevant by the fact that until today no Italian author had reached such positions in the UK charts in that segment. The topics are fully explored in every detail through a cultivated narration, engaging and definitely educational, trying to answer the many questions raised by innovation, news and digital disruption. From the potential of the web to abusing it, the way is short: this is one of the considerations shared in the chapters of People are media. Digital business in the selfie era, warning companies and customers. Ethic, regulation and innovation are intertwined in a contemporary tale. The book explains how the time spent online by the users generates a significant volume of data and personal information which represents an unlimited resource for companies. The online itinerary of each individual reveals his habits and desires in a way which is far more coherent than any other possible market research: the data helps to understand the trends, obtain instant feedback on products and predict the preferences on the market, from purchasing habits to electoral choices. This represents a unique opportunity for companies, for the first time they have the opportunity to listen to customers and edit their consumer experience in real time optimizing their business. English version available in paperback edition for £7,72 and Kindle format on Amazon.co.uk. Aldo Agostinelli has a considerable experience in the marketing and digital direction of many Italian and international companies: from 2010 to 2013 he was digital marketing director at Hewlett Packard in San Francisco. Previously he worked for companies such as H3G, TIM, Ericsson and INA Assitalia. At Sky Italia since 2013, he was appointed Digital Officer in 2016. Aldo also holds the position of vice president at the association IAB Italia. Silvio Meazza is born as software designer and IT Manager. In the communication field since 1998. He overcame with some effort but unharmed, the Millenium Bug, the Dot-com Bubble, the crisis of 2008 and David Bowie's death. Between 2000 and 2009, he managed 4 digital companies inside all the main Communication Groups (beside WPP), working for clients and brands such as Renault, BMW, Fiat, Seat, Deutsche Bank, Intesa San Paolo, Unicredit, Mars, P&G, Ferrero, Sky, Telecom Italia, Fastweb. In 2010 he founded, together with 4 business partners, M&C SAATCHI Milano. Today the company has a team of a 100 employees, 4 Cannes Lions, an amazing location next to a cinema and some of the best clients in Italy. Silvio has 2 sons, Federico and Filippo, with a C grade in Computer Science but A in Italian Language. He loves cooking, art of the 20th century, Venice, cinema and that incredible moment after clicking file->new when the cursor flashes on a blank page.